Harmonix and Mad Catz today revealed another new batch of tracks set to be available in Rock Band 4 at its October 6th launch. The new songs come courtesy of Foo Fighters, Aerosmith, Ozzy Osbourne, Paramore, Live, The Cure, Dream Theater and others. Take a look at the new reveal trailer and the announcement below! Rock Band 4: New Songs Revealed! Harmonix Music Systems, Inc. (“Harmonix”) and Mad Catz Interactive, Inc. (“Mad Catz”) are excited to reveal additional tracks that will be included in Rock Band 4, the next generation of the award-winning social and interactive music gaming platform releasing globally October 6, 2015 for the PlayStation 4 computer entertainment system and Xbox One, the all-in-one games and entertainment system from Microsoft. 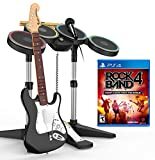 Players can assure they’re ready to rock on launch day by pre-ordering game and hardware controller bundles through their favorite video game retailer; details can be found at http://www.rockband.com. From “Toys in the Attic,” off legendary rockers Aerosmith’s platinum-selling third album to the Foo Fighters’ “The Feast and the Famine” from the band’s latest album, Rock Band 4 features a diverse range of music, spanning multiple decades, artists, and musical styles. Along with just-announced tracks from The Cure, Dream Theater, St. Vincent, and more, Rock Band 4 will showcase one of the best soundtracks in the franchise to date, carefully curated by an experienced team of game developers and music lovers for an incredible full-band gameplay experience. These newly announced songs join an already impressive soundtrack line-up, including music by Avenged Sevenfold, Elvis Presley, Jack White, The Killers, Mark Ronson ft. Bruno Mars, Queens of the Stone Age, The Who, and more! A full list of songs announced for Rock Band 4 can be found here. Additionally, Rock Band 4 will be instantly compatible with more than 1500 tracks available for download on the Rock Band Music Store, as well as many tracks exported from previous Rock Band titles. Rock Band 4 will be available on October 6.